Perspective is a powerful and lightweight library to create scrolling and motion parallax. A behaviour is an object that allows you to interact with the perspective view. If you want to let your users to scroll the persective you can add a PerspectiveScrollBehaviour, and if you want to use the accelerometer just add a PerspectiveMotionBehaviour. To add a new behaviour to your perspective view you must call the addBehaviour method. the PerspectiveView's frame rectangle: describes the view’s location and size in its superview’s coordinate system like any another UIView. the PerspectiveView's contentSize: defines the extent of the content (usually UIImageView). the arrangedSubviews: list the views arranged by the perspective view. The order of the views work like in any UIView. The foreground view is at the end of the array (as opposite to the background which is the first element of the array). To go further, take a look at the example project. The recommended approach to use Perspective in your project is using the CocoaPods package manager, as it provides flexible dependency management and dead simple installation. 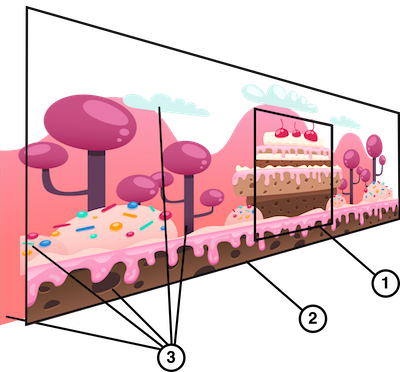 You can now import Perspective framework into your files. Download the project and copy the Perspective folder into your project to use it in.